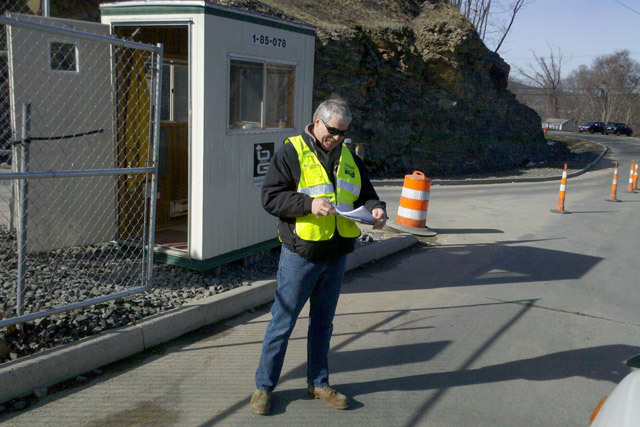 Campus Community Emergency Response Team member Bill Nelligan records the names of personnel accessing the Kleen Energy power plant in Middletown following the deadly explosion Feb. 7. The C-CERT group volunteered almost 100 hours of time. On Feb. 7, the nearly-completed Kleen Energy power plant in Middletown exploded during a natural-gas purging procedure. It was a tragedy for the community that shook the earth in Middletown and beyond. The explosion caused the death of six people and injured more than 12 others. Soon after the explosion was felt, Wesleyan’s administration offered to support rescue efforts in any way possible. Middletown officials quickly requested that Wesleyan activate its Campus Community Emergency Response Team (C-CERT) and have them assist at the explosion site. Over the next few hours, C-CERT team members Cliff Ashton, director of Physical Plant; Stacy Baldwin, construction project coordinator; Bill Nelligan, director of environmental health, safety and sustainability; Ricky Howard, project manager in Physical Plant; and Don Albert, facilities manager, arrived at the site to provide support. C-CERT members worked between 6 a.m. and 9 p.m. that day in windy conditions and freezing temperatures. Nelligan and Baldwin towed a diesel generator and heater unit to the explosion site, which provided supplemental heat inside a 25-bed tent. In the ensuing days, all 12 members of Wesleyan’s C-CERT continued to volunteer at the site by staffing the site access checkpoint. Joyce Walter, director of the Wesleyan University Health Center and C-CERT team member, worked a checkpoint shift Feb. 8. During that time, she met two sons of one of the victims. They had come to pick up their father’s vehicle. Although not part of the C-CERT group, Wesleyan students, when they heard about the first responders who were working day after day to save lives and clear rubble, reached out to help as well. In coordination with the city of Middletown and with support from Bon Appetit, several students prepared a freshly cooked dinner Feb. 12 for the 50 first responders out in the field. Many students have also expressed a desire to raise funds and contribute to the Victim’s Family Fund, a fund created to provide financial support to the families of the five victims. Some students are even planning a benefit concert for the cause later in the semester. In total, the C-CERT group volunteered 98.5 hours at the site over the next several days, of which 75 hours were on nights and weekends. They teamed up with other CERT groups from Middletown, Manchester and East Hampton, Conn. Formed in September 2009, Wesleyan’s C-CERT was trained to assist first responders, provide immediate assistance to victims, and organize volunteers at a disaster site. This was the C-CERT team’s first deployment in the community. “This certainly brought us closer as a team,” says Christine Cruz, safety coordinator from physical plant and C-CERT member. “Getting organized was key and we learned a lot the first couple of days. Other C-CERT members who assisted with the emergency response support at the power plant include Cheryl-Ann Hagner, director of university events and scheduling; Josh Hamilton, Usdan University Center evening manager; Michelle Myers-Brown, Usdan University Center director; Roseann Sillasen, associate director of physical plant; and Joyce Topshe, associate vice president for facilities. The C-CERT team is always looking for new members. For more information email wnelligan@wesleyan.edu. More information about Wesleyan’s C-CERT Team is online in a past Wesleyan Connection.